This year's event featured another impressive keynote performance by Steve Jobs, extolling the great now iPod line, but not fully explaining the scope of the changes -- it's not just features and functions, but more of a re-imagining and repositioning of what iPods are all about. Yes, the new iPods are smaller and lighter and less expensive and sexier than ever, but they also are significantly re-focused in terms of how you might want to use them. 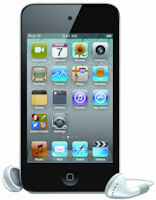 In particular, the iPod touch is now the star of the line, having supplanted the nano as the most popular model. The touch is now fully targeted as a gaming and entertainment system -- Jobs called it the number one portable game player in the world, outselling Sony & Nintendo portables combined, with over 50 percent market share in the U.S. and worldwide. The new touch is thinner and lighter, yet has picked up many features of the recent new iPhone 4, including the high-res Retina display, dual cameras with microphone for FaceTime video calling and HD video recording, three-axis gyroscope for gaming, and more powerful Apple A44 mobile processor. It holds the pricing on all but the low-end model, at 8 GB for $229, 32 GB for $299, and 64 GB for $399. So the touch is now "the iPhone without the phone" -- almost -- as Jobs carefully did not use that description himself, instead attributing it to others. In particular, the touch still does not have the GPS capability of the iPhone, and so misses out on the exciting and interesting apps developing in location-based tracking and services (see my Smartphone Apps Gallery). Meanwhile, the tiny clip-on iPod shuffle reaches back to the 2008 model to return the control pad that was eliminated in last year's version (the only controls were on the earbud cord). Trimmed to a smaller size just large enough for the controls, it retains last year's VoiceOver feature to announce song and playlist name, since there's no display for browsing your collection. But the new version is only available with 2 GB of storage suitable for "hundreds of songs", and no longer with a 4 GB model. The price also drops $10 to $49. Limiting the shuffle's capcity fits in to the biggest change in the iPod line-up -- repositioning the iPod nano from a media / video player back to a music-focused player, but now with a multi-touch display. The new nano is square, with the display filling the front face -- the controls have been eliminated and replaced by touch-screen gestures. This is a very different nano, shrunk by half to only about 1 1/2 x 1 1/2 inches. The interface is iPod-ish, with a home screen and the ability to customize the icons, but the tiny 1.5" screen means that only a few buttons or song names visible on the screen at a time, requiring a lot of touching and swiping to explore a larger collection. This is therefore a new product, not a derivative of the previous nano line. It's no longer a media player, having lost video playback, camera, microphone, and speaker, although it does retain the FM radio. Instead, the new nano is focused as a multi-touch music player, now even with a clip on the back (like the shuffle). It's now more like the shuffle with a display, and with 8 GB of storage for $149 or 16 GB for $179 for thousands of songs. Meanwhile, although unmentioned in the Jobs keynote, the iPod classic still lives on as the boring older sibling, with heavier hard disk instead of less expensive flash memory, and therefore offering 160 GB for $249, compared to 32 GB for $299 or 64 GB for $399 with the touch. That's enough to hold 40,000 songs or 200 hours of video for those who want their entire collection in their hand. See my Apple iPod / iPhone / iPad Gallery for more details and chronologies on these product lines and associated software and services. Roxio Creator is Roxio’s flagship suite of digital media applications -- Roxio describes it as the leading toolset for digital media. Creator is a deep collection of media tools, with over 10 major applications to handle data, video, music, and photos, plus 20-some additional tools for dedicated tasks. The latest edition, Roxio Creator 2011, was released in August 2010 for $99.99 ($80 street), with two major additions -- 3D video and home media sharing, within the home and across the Internet. Yes, that cool 3D that the movie industry has been promoting with blockbusters like Avatar, and that the consumer electronics industry has been pushing with 3D HDTVs and 3D Blu-ray players, is now already available in a sub-$100 consumer software for you to create your own content. And this is not a partial implementation -- Creator has tools for importing, editing, exporting, and displaying 3D, for video and photos, in a variety of formats. Even better, you don't need to buy any additional new equipment. You can get started by displaying in 3D using simple anaglyph (red / blue) glasses, to view on your existing PC monitors and TVs, and share on DVD, Blu-ray, and online. And you can even use your existing 2D photos and videos -- Creator will convert them to 3D, and you can tweak the depth adjustments. Creator is also available bundled with additional applications, as Roxio Creator 2011 Pro for $129, which adds Blu-ray Disc authoring, Roxio Secure Burn for backup and disc encryption, SmartSound Sonicfire Pro for custom soundtracks, Bias SoundSoap for noise reduction, and BackOnTrack for backup and disaster recovery. See my full article -- Walkthrough: Roxio Creator 2011 Digital Media Suite -- for more on the Creator suite, applications, and 3D support. The mophie juice pack line of rechargeable external batteries for the iPod and iPhone is growing. In addition to the juice pack air line of protective cases with built-in battery, there's also two clever battery packs with retractable iPod connector, the juice pack reserve and the juice pack boost. The mophie juice pack reserve is a small and light 1000mAh handheld charger (3.15 x 1.60 x 0.63 in.) for $39.95, while the juice pack boost packs 1500 mAh in a slightly larger size (3.70 in x 2.03 in x 0.63 in.) for $59.95. Both are powered with a high-output lithium polymer battery rated to charge up to twice as fast as conventional 500mAh batteries. You charge these through a micro USB port on the side, and then slide out the retractable 30-pin iPod connector to charge your iPod or iPhone. There's no power button to accidentally leave on -- it turns power on only when it is connected. The juice packs have a handy set of four LEDs to indicate charging status, or you can press the button to have the light up to show the charge level, so you know when it's time to recharge. And if the juice pack design was not clever enough, holding down the button turns on a built-in LED flashlight. LaCie is at it again, with new clever designs for USB drives that solve real issues. If you want to carry a USB drive all the time, for example, then check out the LaCie metal keys, including the WhizKey and CooKey USB drives -- shaped like real keys with built-in USB connectors to make it easy and safe to carry storage on your key ring (see earlier post). But there's a different problem if you tend to leave your USB drive plugged in to your computer -- it sticks out the side, getting in the way and susceptible to damage. So the LaCie MosKeyto USB key is designed to tuck neatly flush against your laptop, with extending out only some 6mm. The design is small, but not too tiny, with a protective cap and key ring strap for on the go. The LaCie MosKeyto USB key is currently available with 4 GB of storage for $17.99, and 8 GB for $27.99. LaCie has another interesting design idea for USB drives, in addition to the new LaCie MosKeyto (see previous post). The issue here is that as USB drives have shrunk from small to infinitesimal, it's just too easy to mislay and lose them -- And heaven forbid if you sneeze! Today's tiny drives are half the size of a SD card -- the width of a USB connector, but only half as thin (so you need to be careful to insert them flush in the correct orientation). The LaCie WriteCard includes this kind of tiny drive, but in a clever package --a credit card-sized case that you can stash in your wallet, and includes the USB drive, plus a mini pen and notepad. The WriteCard case is about the thickness of three credit cards, so it really does fit in your wallet. It includes the mini Post-It style notepad with nine pages, which slides in one side along with the USB drive. The pen then fits along the other edge, and is the size of a ballpoint refill. LaCie describes the result as designed for recording both high- and low-tech data. The LaCie WriteCard is available with 4 GB of storage for $22.99, 8 GB for $34.99, and 16 GB for $59.99. Entries posted to Manifest Tech Blog in September 2010, listed from oldest to newest.